We need light to see our way in darkness. Similarly, we need a Divine Light to guide us through life. 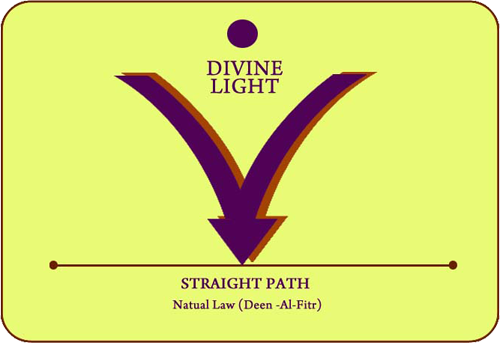 The Divine Light leads to the Straight and True Path - the Natural Law (Deen-Al- Fitr). The Divine Guidance was communicated to us through various Prophets as Messages. The Holy Quran is the final revelation of this Message from God to mankind. This is the only book that speaks directly to humanity. 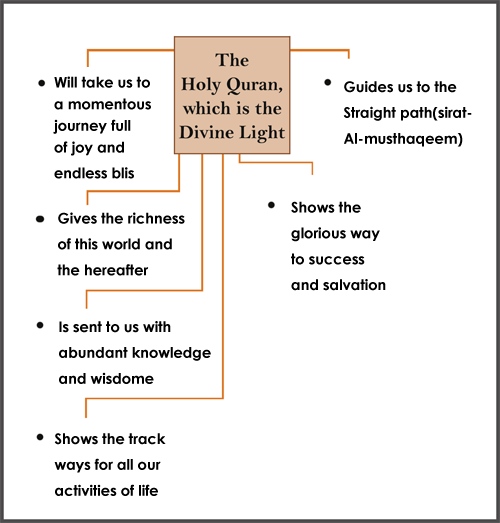 Holy Quran is the Divine Light that provides guidance to the entire mankind. However, it is also necessary to apply the guidance in practice. No medicine can cure illness unless the patient takes the medicine. So if we do not actually follow the guidance, a study of the Holy Quran will have no effect is our lives. Although the Holy Quran was revealed in Arabia it does not pertain specifically to race, culture or civilization of the Arabs, but it speaks to the entire humanity. 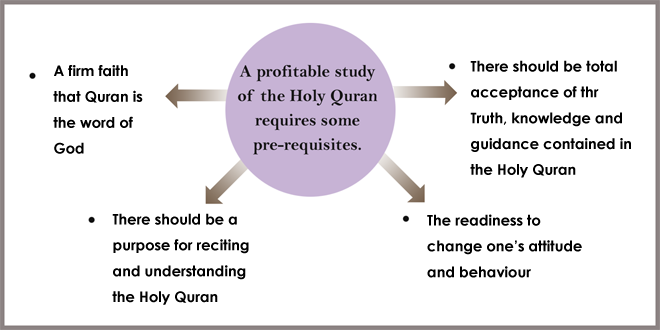 It is the duty of every individual to study the Holy Quran, which is the Divine Light of Almighty Allah for humanity. There is a healing in this book for every problem. Therefore those who want to discover and identify God and His Qualities, should study the Holy Quran with objectivity and discover himself, the truth behind this Scripture. 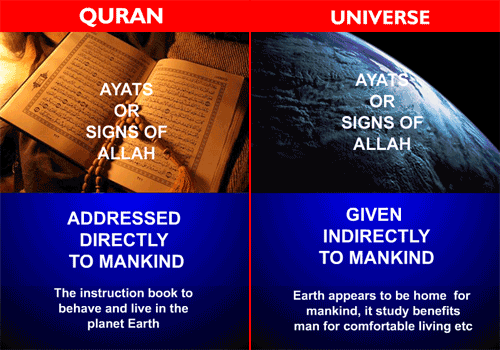 The primary message of the Holy Quran is Tawheed - Oneness of God in Absolute Purity. He is the Ultimate Authority. He is the Lord of the universe. He is the Sustainer, the Master, and the Ruler for all mankind. The second message of the Holy Quran is that God sent His Messengers during various times in various places. Culminating in Prophet Mohammed (PBUH) as the final Prophet. Is the only book addressed directly to mankind. Encourages scientific temperaments to probe the nature of the Universe. Encourages the reflection of human behavior. Is the hope for the disappointed. Gives the liberty for action in this life, but announces that one is accountable in the life hereafter. Sets laws, regulations and guidelines for human activities. Gives enormous bliss to one's mind. Gives guidance to use the universe. Defines the role of man on earth. And the third important message of the Holy Quran is the strict accountability of one's action in the life hereafter. 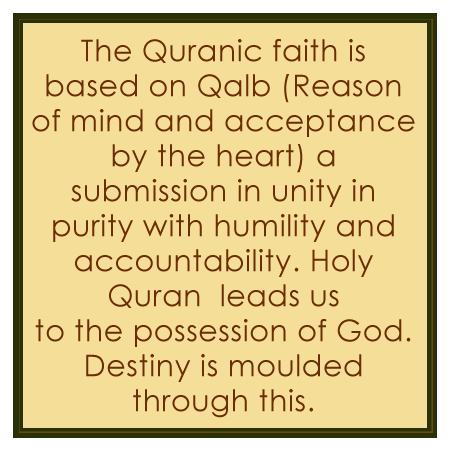 The Quran's faith is based on Qalh - reason of the mind and acceptance by the heart, unity in purity with humility and accountability.